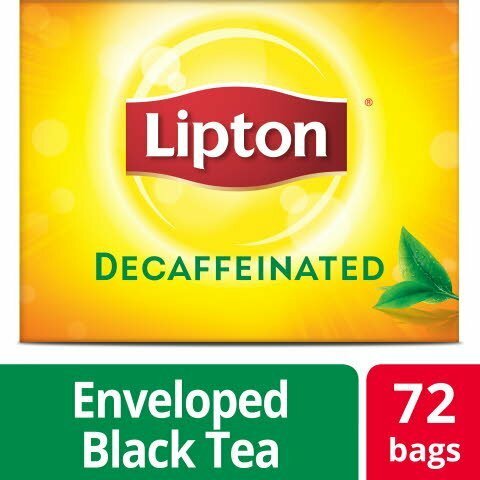 Ideal for restaurants, cafes, hotels, and high-end workplaces, Lipton Black Decaffeinated Hot Tea is a delicious, decaffeinated beverage that can be enjoyed night or day. Made from carefully selected tea leaves, this tea offers a delicious taste and soothing aroma your guests will appreciate. Sourced from 100 percent Rainforest Alliance Certified tea estates, this great tasting blend starts with freshly-picked high-quality tea leaves tested by tasting experts to ensure a perfect blend that will delight any tea enthusiast. The bags, tags, and carton are all recyclable and packaged in a zero-landfill facility, making this tea a responsible choice. Lipton® tea experts select these long leaves to deliver an exceptionally pure tea flavor and aroma. Lipton® tea is calorie free (when unsweetened), has no additives or colors, and helps to keep you hydrated.